Avoid that sinking feeling of guilt everytime you leave your furry friend at home through these blissful summer months by packing them in car too! 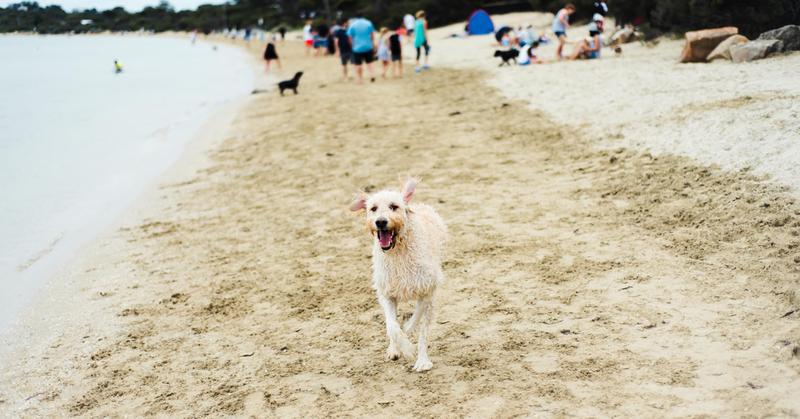 Here's out rundown of the best dog beaches in Melbourne. Man's best friend needs to cool off as well. Just over a half hour drive will land you in the outback setting of the Warrandyte River, an ample setting for a warm day with your woofer. A leash free walk through the bush will lead to you to the water where pups can dive and splash to their heart's content. Lying just after Blairgowrie on the Mornington Peninsula is the sleepy little cove of Camerons Bight. An ideal spot for dogs and owners to share the sun and sand in an environment that is a cut above the rest. Think clean white sand, crystal waters, and all kinds of different doggos to admire (stalk down and pat). Lillydale Lake is just a short trip from Melbourne and has two designated dog zones. Perfect for when the sun is out with lush grass surrounding the water, take a picnic and let the four-legged friend frolick. Snaking through various suburbs of the southeastern region of Melbourne, this trail is well known for its rich greenery and popularity with weekend cyclists. There’s a plethora of nooks and clearings where you and the dog can have a ball. This is a no brainer when it comes to spots to take your dogs, there’s plenty of social interactions, group fetch adventures, and aqua activities. Nestled right inside Melbourne, it’s the best escape for your pet if long distance travel isn’t an option. This secluded spot is a great place to take your pup if you’re up for a bit more of a #properaussie adventure. The name comes from the sound produced by the local waterfall, and there are also a few small rapids that lead to large openings so you can soak up the sun and enjoy the sights and sounds. How’s the serenity? A huge outing for the dog with this epic National Park, large grassed areas, boardwalks overlooking the waters, and plenty of wetland and ponds for a quick dip and a paddle. There’s a dog friendly café located in the park so refreshments are a breeze. Take a summer roadie and check out this spot for the truly radical doggos, let them splash around in the shore break and small waves of Whites Beach, a long stretch of ocean on the more secluded side of Torquay, the whole beach is a leash free zone! A well-known spot for those around the port but a solid choice for taking the dog for a dip, there are plenty of furry friends around and it’s good space for some fetch whilst watching the spirt of Tassie sail away. This one isn’t just a pop-‘round-the-corner spot but your waggy tailed pal is worth it. Pack them in the car and cruise up to the Murray. Once you’re there you’ll know why this is spot #1 for dogs with off leash nirvana. Plenty of different walks hikes and swimming holes to make their sweet little hearts content. After a swim you're going to need a dog-friendly venue to hit up. Here's a rundown of all the best dog-friendly joints in Melbourne.